In March of 2011, I took my first trip to the Holy Land. In April of 2011, I met Mark Braverman, who I call “my brother from another mother.” Mark had just returned from South Africa, where he had met with South African and Palestinian theologians to discuss the founding of an international Kairos network. It is not an understatement to say that we were both on fire from our experiences. My time in Palestine and meeting Mark caused a major paradigm shift in my life and ministry. As a man of African descent and as a fourth generation Pentecostal who lived through the civil rights movement, it was easy for me to see and feel what my Palestinian sisters and brothers are experiencing because I have also experienced being marginalized. Being in that place where the “Prince of Peace” was born and found no peace produced in me a powerful combination of sadness, hurt and anger. And then that pesky question came to me as it always does at times like this: WHAT ARE YOU GOING TO DO ABOUT IT? So, for the last three years I have been on a quest to answer that question. My latest effort came at the Samuel Dewitt Proctor Conference,which I attended with my colleague, Reverend Diane Dulin Kairos, Kairos USA’s Director of Church Participation. The conference bears the name of The Reverend Dr. Samuel DeWitt Proctor, who was a theologian, pastor and professor, and president of two universities — and who made social justice the cornerstone of his ministry. 12 years ago. The theme of this year’s conference, which was held in Dr. Proctor’s hometown of Norfolk, Virginia, was Reclaiming Our Moral Authority: Faith and Justice in the Age of Reinvented Empire (Proverbs 31:8-9). The mission of the Proctor Conference is to nurture, support and mobilize African American faith, civic corporate and philanthropic leaders to address critical needs of human and social justice within local, national and global communities through education, advocacy and activism. For the past three years, Kairos USA has been a full and active partner of the Proctor Conference. This year the conference offered three workshops entitled Kairos USA: The Call from Ferguson To Palestine. In our workshop, Diane and I were able to share the specific work of Kairos USA. This included showing a video from the recent Howard University Symposium in Washington, DC titled “Occupied Palestine: What can the Black Church Do?” Diane did a masterful job setting the historical and theological context of our work. Diane and I were asked to share in the other workshops, led by Rev. 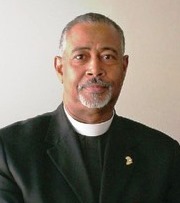 Dr. Marvin McMickle, president of the Colgate Rochester Crozer Divinity School, Rochester, NY; Rev. Carolyn Boyd of Plymouth United Church of Christ, Washington, DC; and Rev. Taurean Webb, of the Samuel DeWitt Proctor Conference. We were able to share our brochure and our Call to Action: U.S. Response to the Kairos Palestinian Document at each of the workshops. I was extremely pleased that Sam Jones, president of Heartland Initiative, participated in our workshop and provided great insights on what is happening on the ground in Palestine. We shared that we are looking to sponsor a pilgrimage to the Holy Land and are planning other symposia in Atlanta, GA and Chicago, IL. I am happy to be able to make a contribution to the work of Kairos USA as Director of African American Church Relations. It is my hope and prayer that we will be able to share this important work with the many leaders of the African American church. When I came back from my two trips to the West Bank, I was asked by many of my friends what it felt like to walk where Jesus walked. I told them it felt good to walk where Jesus walked but it felt even better to walk where Jesus is walking today and that is with those who are undervalued, underestimated and marginalized. The Civil Society Task Force of the United Nations selected nine persons to present their point of view and ... Read more! 50 college ... Read more! NORTH TEXAS (CBS 11 NEWS) – Critics of mandatory minimum sentences for non-violent offenders ... Read more!